Black Friday: It’s raining. I’m sure the deluge will ruin shopping in our area, but maybe not. On the news I saw footage of shoppers shoving their way into stores. Some had a crazed look in their eyes. I’m locking myself up in the house to work on my writing and music business. 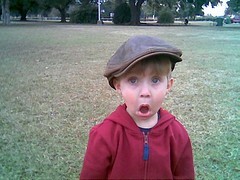 MASON: Here are three photos of my grandson. 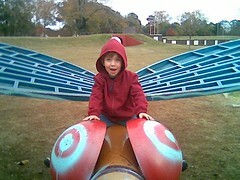 First, as Spiderman (his Halloween costume), and then two of an afternoon together in Forsythe Park in Monroe. He is riding the dragonfly in the first, then he wanted me to take a picture of him in my hat. On Nov. 7, I presented programs at Dubach High School. The beautiful Amanda Cauley, a champion of literacy, arranged it. Here are a couple of photos from that event. Part of my Civil War program involves teaching about Civil War Reenacting (Living History). I take both of my uniforms (Federal and Confederate, or if you prefer, Yankee & Rebel). 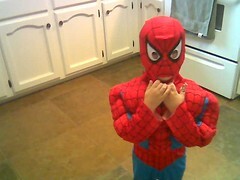 The kids love to be dressed up. 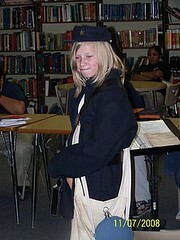 As I had on my Confederate uniform, this student had to make do with the Yankee getup. The second photo is of Amanda Cauley and a fellow teacher. 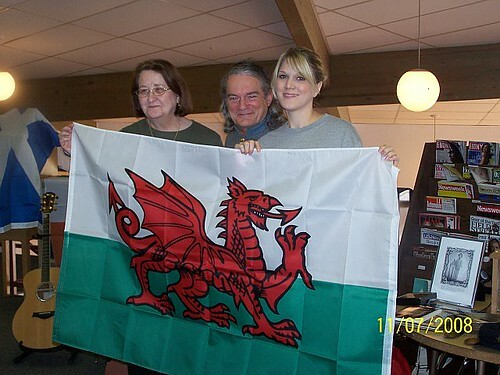 They wanted their picture taken with the Welsh flag I take to my presentations.